More After Long Research & Development, Come out with a Chilli Seed Variety which makes Farmers feel Happy after seeing the result at the time of Harvest. Amaravathy 339 was treated by 6 Plus Nano Technology which makes plants to resist in any type of Climatic Conditions, and Plants have more resistance from pests or Diseases, Amaravathy 339 is a legacy brand of Swastik seeds, All our products are licensed and tested. 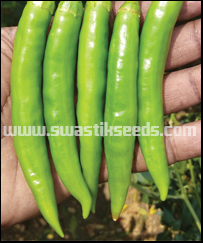 Item: Chilli OP Variety: Amaravathy 339 Days to Harvest: 75-85 days after planting Characteristics: stems and thick bush. Dark green in color while starting and bright red after becoming fruit. Fruit height 9-15 cm. Fruits have more seeds.